Holy. Crap. I just got given all those CDs I bought from Amazon, in a format I can use, for free. 1706 songs, to be exact, many of which I probably had forgotten about. Now THAT is surprise and delight.This is how you leverage your past relationship with your customers to foster massive loyalty. I read about this move, of course (it’s called AutoRip), and thought “Wow, that’s cool,” but then forgot about it. This is the *exact opposite* of what I’ve come to expect from the music industry. With those chuckleheads, every time you change formats, you have to buy the music all over again. I have no idea how Amazon got them to play along with this, but I am sure as hell glad they did. Now, I probably have most of this music already ripped to my iTunes, but I plan to download the whole lot of it anyway, because it’ll be way cleaner, with metadata and the like. So. Cool. 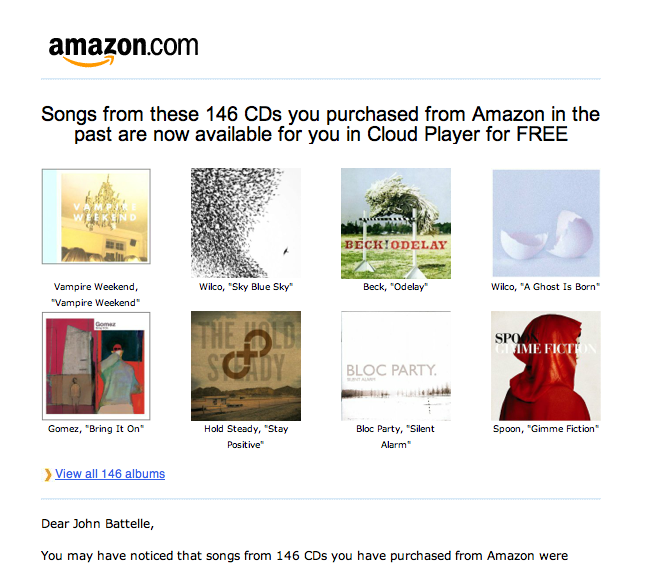 was this offered to all the CDs you have ever bought from amazon. Regardless, it is impressive that they managed to get the record companies to go along with this idea! I wonder if they even had to ask the companies, with CDs, you OWN the music, I think, as opposed to streaming services. In any case, it’s every CD i ever bought there since 1996. I am hoping the same will happen with Kindle books! What’s amazing is that Amazon, despite their dominance, can’t seem to make a profit. I guess after this now we know why.